De Quervain syndrome is a common source of wrist pain. 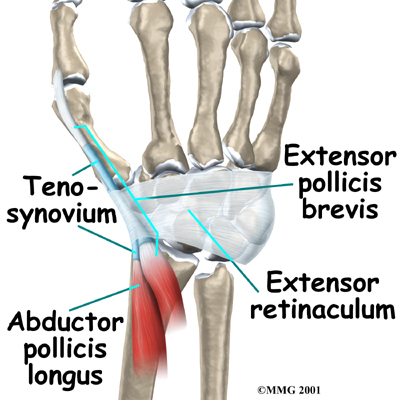 It is a painful inflammation of tendons in the thumb that extend to the wrist (tenosynovitis) – the abductor pollicis longus (APL) and extensor pollicis brevis (EPB). The swollen tendons and their coverings rub against the narrow tunnel through which they pass. This results in pain at the base of the thumb and extending into the lower arm. The cause of De Quervain syndrome maybe insidious – overuse, a direct blow to the thumb, repetitive grasping, and certain inflammatory conditions such as rheumatoid arthritis can all trigger the disease. Symptoms of De Quervain syndrome include pain along the back of the thumb, directly over two thumb tendons. The condition can occur gradually or suddenly, but in either case, the pain may radiate into the thumb or up the forearm. Thumb motion may be difficult and painful, particularly when pinching or grasping objects. Swelling and pain on the side of the wrist at the base of the thumb may also occur, and may increase with thumb and wrist motion. The Finkelstein test is used most frequently to diagnose De Quervain syndrome. This test is conducted by making a fist with the thumb placed in the palm. When the wrist is bent toward the outside, the swollen tendons are pulled through the tight space and stretched. If this movement is painful, you may have De Quervain’s syndrome. In certain cases it may be difficult to distinguish between De Quervain syndrome and the findings of scaphoid fracture, flexor carpi radialis, tenosynovitis or degenerative arthritis of the first metacarpal joint. Therefore, sometimes radiographic x-rays or MRI studies are necessary to help exclude other possible etiologies for this syndrome. A physical diagnostic examination by a skilled clinician can determine the correct diagnosis. usually involves wearing a splint 24 hours a day for four to six weeks to immobilize the affected area and refraining from activities that aggravate the condition. Ice may be applied to reduce inflammation. If symptoms continue, your doctor may give you anti-inflammatory medication. Injecting the area with corticosteroid has shown to decrease pain and swelling. Platelet-rich plasma (PRP) has been a useful alternative treatment, releasing growth factors that may help with chronic symptoms of wrist pain. Platelet-Rich Plasma (PRP) therapy captures the healing growth factors that are in a person’s own blood. By injecting the PRP into the damaged area of the wrist, it may help heal the affected area and diminish pain. In addition, there are indications for platelet-rich plasma in healing a variety of conditions, in much the same way that stem cell therapy may help regenerate different types of tissues. If De Quervain’s syndrome does not respond to conservative medical treatment, surgery may be recommended to release the tight covering of the tendon, eliminating the friction that causes inflammation and restoring the tendons’ smooth gliding capability. If you continue to suffer with De Quervain syndrome and your current treatment plan leaves you feeling hopeless, perhaps a fresh set of experienced eyes can change your outlook. Since 1990, Dennis M. Lox, M.D has applied his personal interests in sports medicine, cutting-edge regenerative medicine and chronic pain management to helping patients increase their quality of life. Contact us for an appointment at 727-462-5582.